Music is always playing as you walk down the strip (Las Vegas Blvd). You will be inclined to have your own little dance party. I was. Vegas is for lovers. I don't know what it is, but it was PDA on steroids when I was there. I thought we were going to see some Vegas babies conceived right there on the street. I don't know if it was so much true love as it was bottles of vodka walking around in human form (Friends reference anyone?). If you like to smoke and wish you could do it indoors, Vegas is the place for you. You can pretty much smoke anywhere you please. This was not my favorite feature, but it was indeed a feature. Getting a rental car in Vegas is completely pointless. You can walk most places, and cabs have you covered for the rest. I would have been really upset that I paid to rent a car if work hadn't foot that bill. I was still mildly frustrated by my naivety. As cool as Las Vegas was during the day, it was that much cooler at night. There is just something about seeing the whole city lit up. People are constantly drinking. This was somewhat expected, but I have to admit, it was a little depressing seeing people drunk at 10 AM. 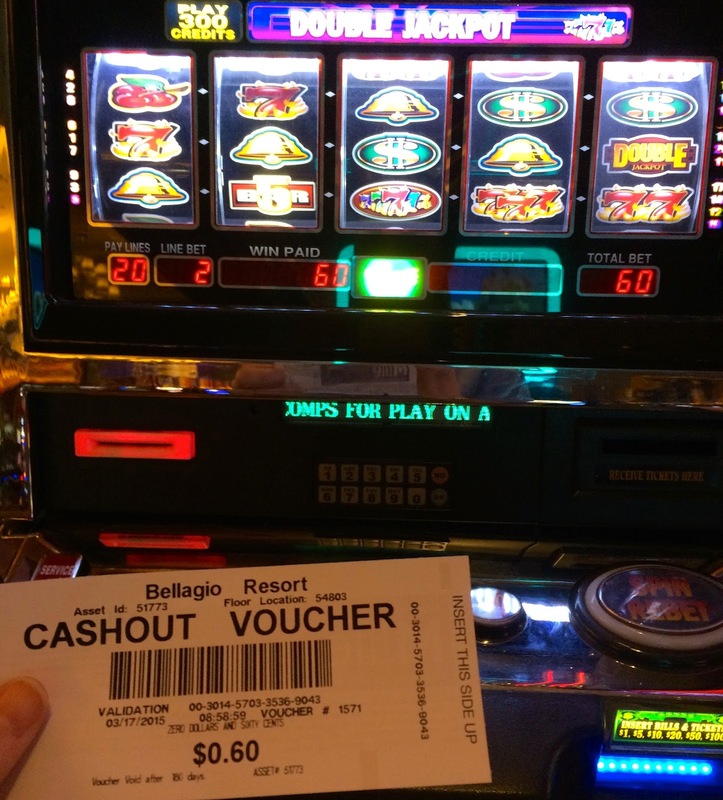 Slot machines are complicated. I knew I wanted to play a couple for the check in the box (I gambled away a whopping $6, earned back $0.60, and then gave said $0.60 to a street performer.). It's not just "pull the lever". You have to bet credits, choose how much you want to bet, etc. Confusing. I didn't get it. 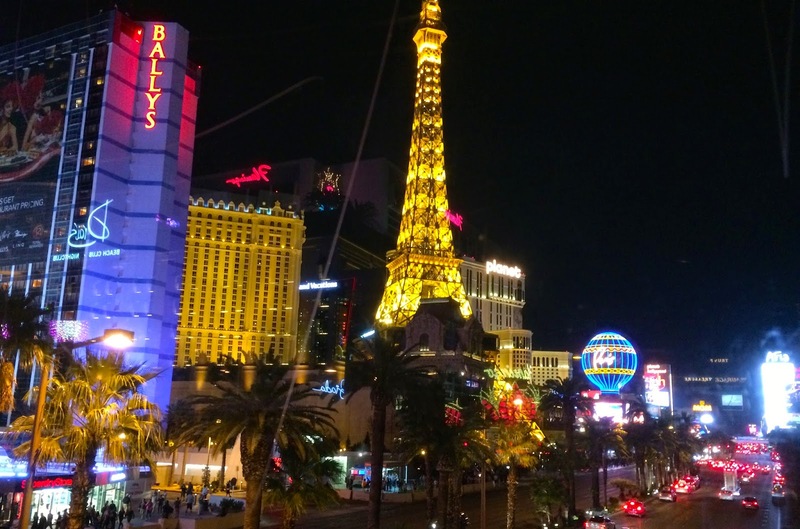 The strip is easy to navigate. I have one of the worst senses of direction you will ever come across, and I managed to figure it out solo. If I could do it, you can too. This goes without saying, but the shopping is pretty cool. Once I ogled the Chanel, Prada, and Gucci stores, I went to the land of the familiar... aka, Gap. Vegas must have some sort of deal with Panda Express. There was one on every block! I've never seen so many Panda Express's in my life. Move over, McDonald's. Normally I would be a little apprehensive walking around a foreign city by myself, and especially at night, but Vegas affords you the ability to rely on pack immunity, so to speak. The strip was full of people everywhere. How cool is this place?! Loved it. 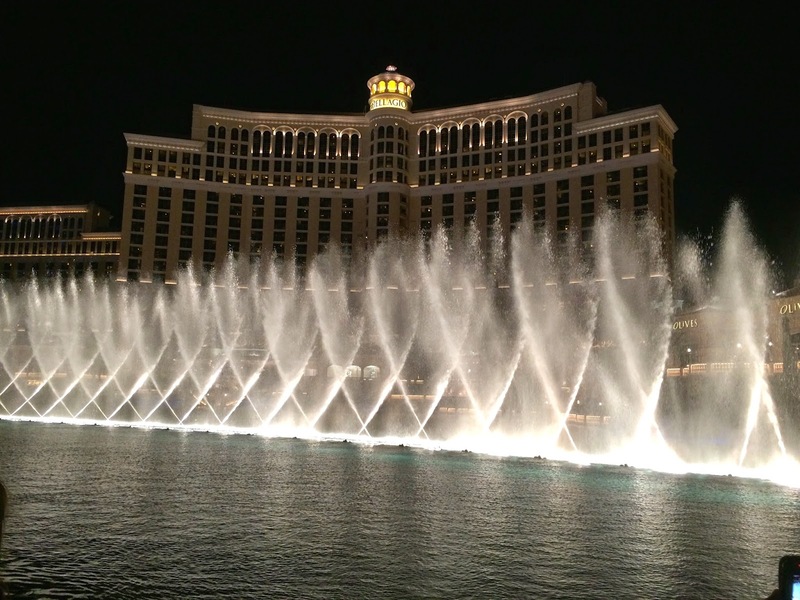 The Bellagio dancing fountains are a must see. It's a beautiful little show! Holding my winnings. So proud. Playing the slots at 10 AM before work started for the day. And that's Vegas! Pretty darn cool city. I recommend seeing it. Vegas is my fave! You should definitely go back with Parker for a long weekend (since you really don't need to stay much longer than that.. amirite?). The fountains at the Bellagio are hands down my favorite part and I could watch them at day! Glad you had fun, friend! 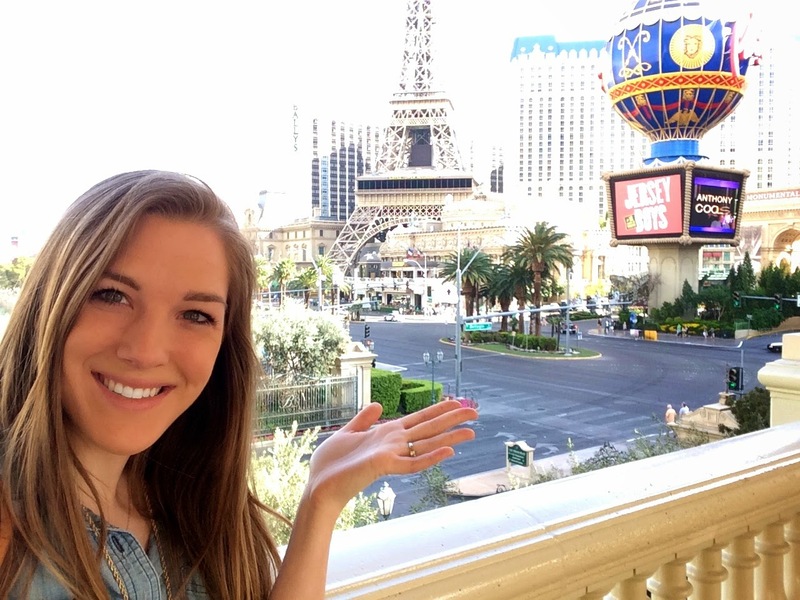 I loved your recap of this trip-- I've never been to Vegas but it's one of those places I'd like to see one day even though I think I'd either love or hate it, haha. Lol @ the drinking midday. 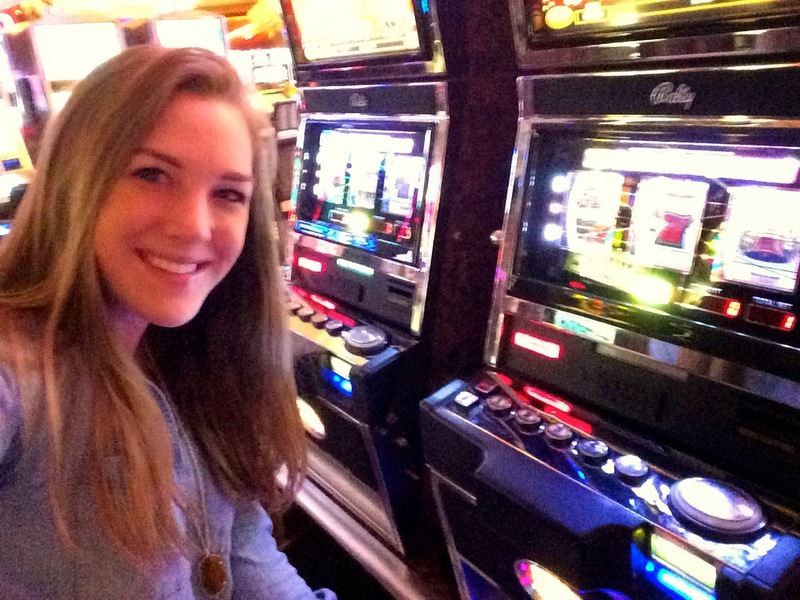 I was running in a race in Vegas and was SHOCKED at people gambling like at 10am. How weird! The smoking indoors was awful. And the best way to get your money's worth on food is to hit the buffets. All of the restaurants we went to were super expensive. Vegas is amazing! We are headed there in May and I'm looking forward to it. What an awesome trip for work! I have always wanted to go to Vegas :D Sounds like you had fun! I wouldn't gamble though -- I have tried and I just have really, really bad luck ha ha. glad you liked it!! Growing up I was able to go a number of times and I loved it. I think Vegas is a fun city aside from all the drinking/gambling/shows... I always try and tell people to go and just don't participate in that part. The shopping, all the hotels! So cool! I love when work pays for trips to places like this! I am glad to see I am not the only one who finds slot machines confusing. I end up just pushing random things to get the jingle going and hope for the best. I love Vegas!! I've been three times, and it is just so much fun. Dan and I want to go back soon, but it'll be a while I'm sure. Glad you enjoyed it even though you had to work!